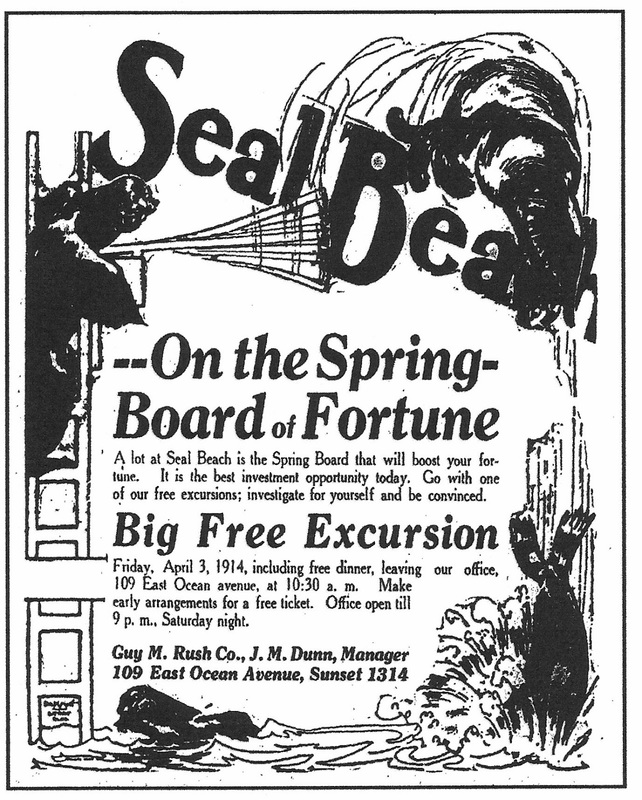 "Seal Beach - on the spring-board of fortune. 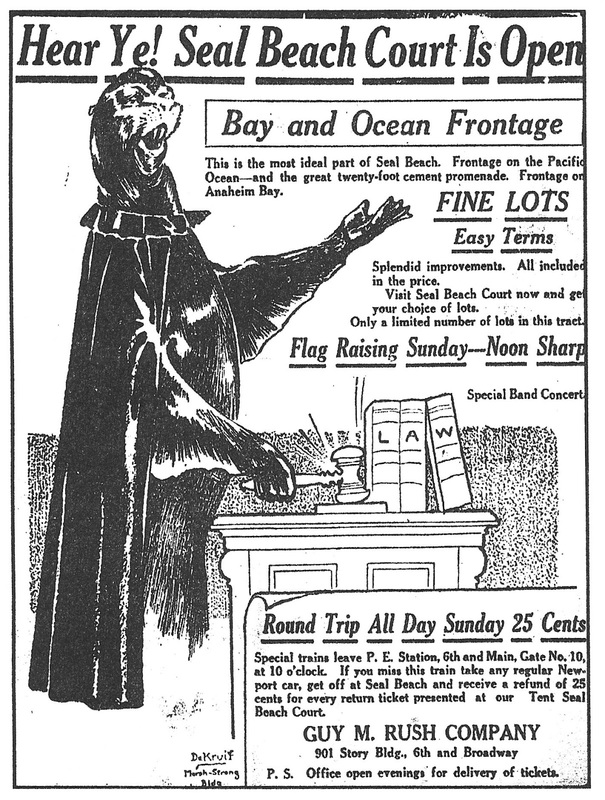 A lot at Seal Beach is the spring board that will boost your fortune. It is the best investment opportunity today. Go with one of our free excursions; investigate for yourself and be convinced." 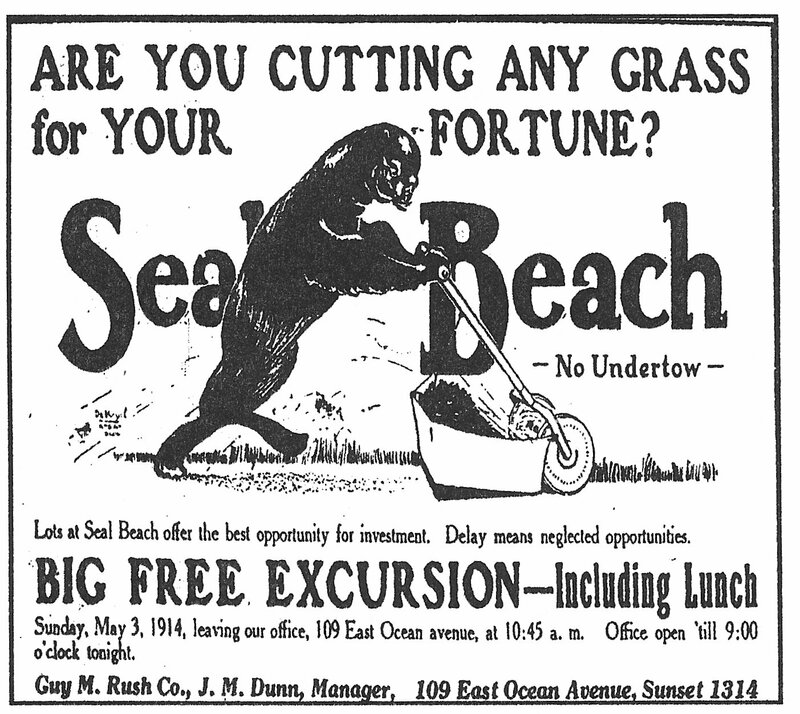 There were many opportunities to make money in real estate in Seal Beach. Property that sold for $4600 in July 1913 was now worth $1,000. alleys; cement walks and curbs; electric lights; everything paid for. 300 room bath house, dancing pavilion...."
On the point of land at the entrance to Alamitos Bay, west of Seal Beach, stood a flagpole proudly flying the American flag. At its base a large sign read: "From 150 to 200 seals have made their home at Seal Beach for the past 8 or 10 years. They are usually found in front of this sign at low tide. As the tide rises they go out to fish, returning only to their sunning grounds at this point after feeding. The seals are very timid and have been disturbed a great deal by the railroad work, but are now returning to their old habits and should be seen here in numbers at low tide." April was the month that baby sea lions (it was sea lions, not seals, who really hung out in Alamitos Bay). Visitors flocked to Seal Beach to watch the mothers in the bay giving the youngsters fishing lessons and carrying them on their backs when they go tired. Like human children, the young seals had to be taught to swim. They also loved to play with people in the water and, in fact would follow a person onto the shore. This was sad, because a mother seal would often reject her offspring if it smelled of a human. our free excursion and see them feed the seals between 11 o'clock and noon." 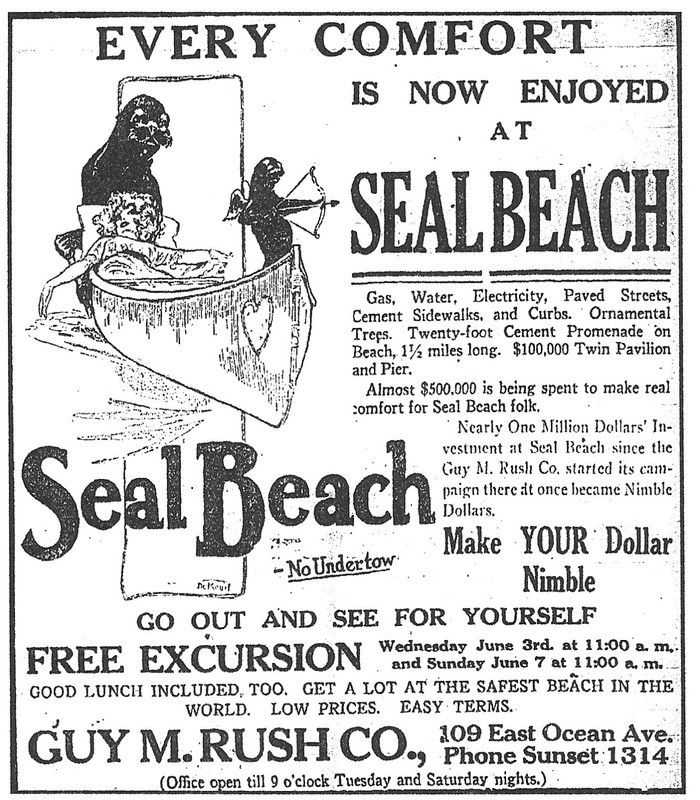 Seals continued to be the advertising theme of the city. 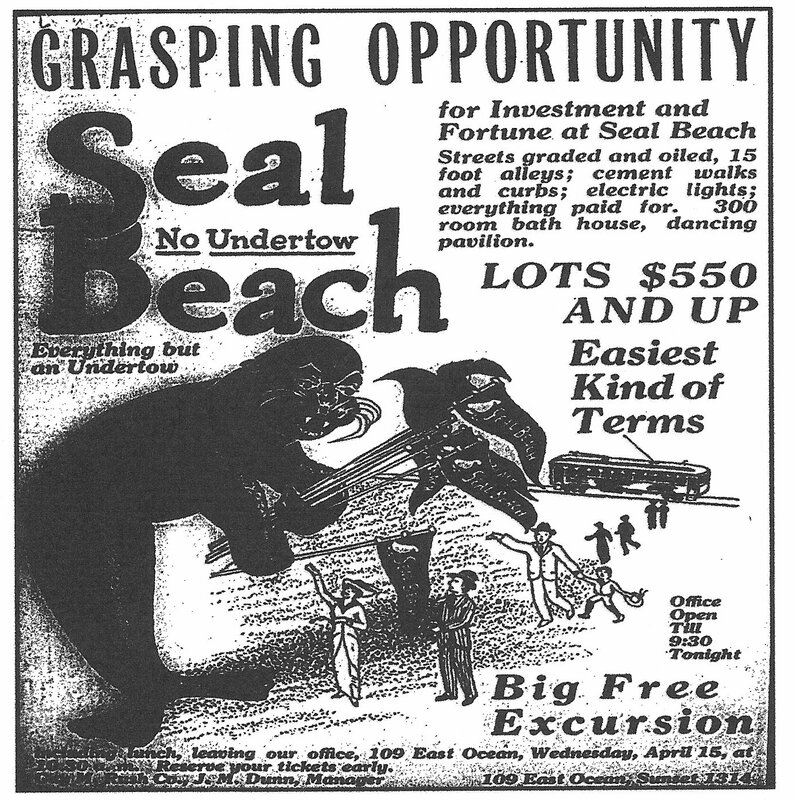 In 1925, local fishermen in Alamitos Bay were angry because the seals destroyed fishing nets and ate too many fish. An average seal consumed 8 to 10 pounds of fish a day, but this was only a fraction of the fish they killed each day, according to those trying to get rid of them. 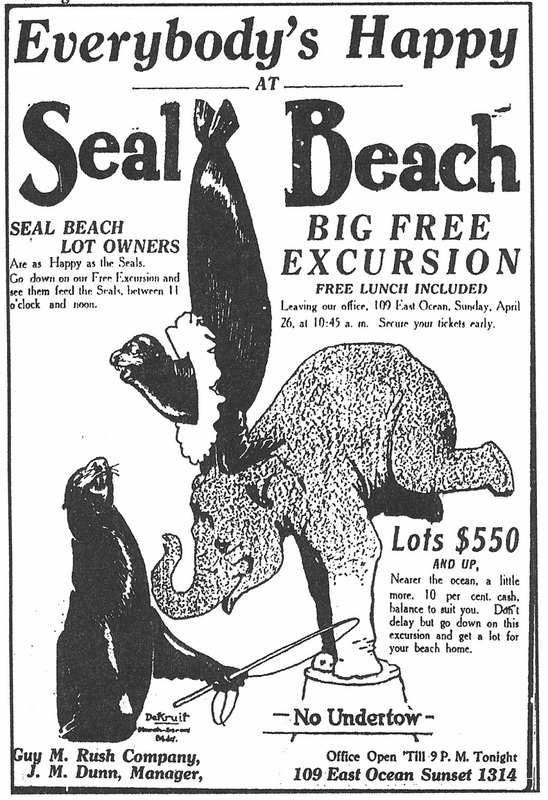 In Long Beach it was suggested that the seals be moved to Lake Elsinore. It was an ideal spot, according to some. The lake was stocked with carp, which humans did not like to eat, but which would make fine feed for the seals. With the seals out of the way, the State could stock the bay with striped bass and other edible fish, making it one of the greatest fishing spots in the world. Seal Beach would have nothing to do with removing their beloved seals. Bayside Land Company president Philip Stanton sponsored and helped pass a bill in the California legislature protecting the furry mammals. 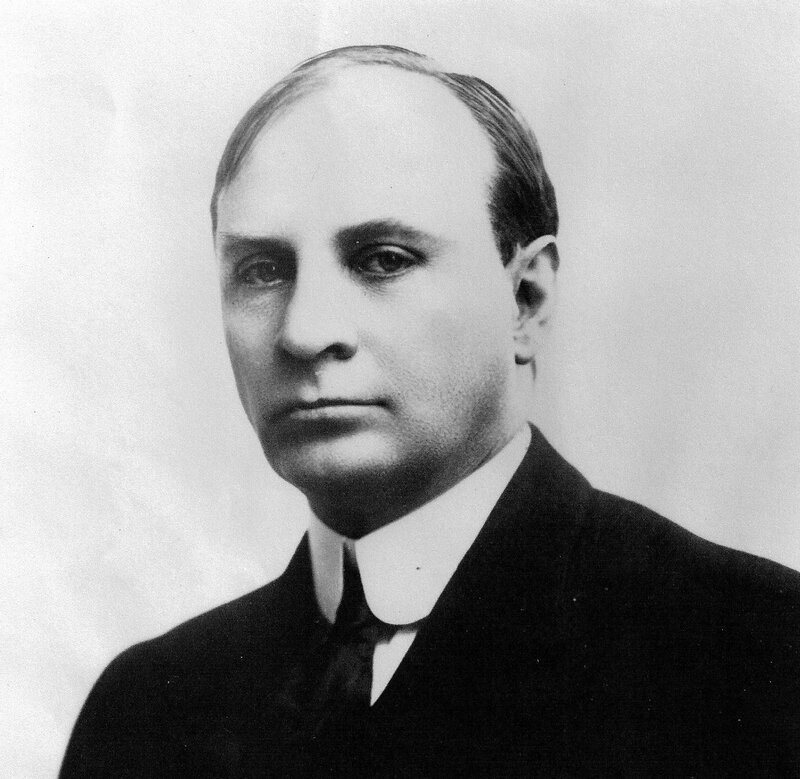 Stanton had served as a member of the State Assembly from 1903 to 1909; he chaired the Ways and Means Committee in 1905 and was Speaker of the House for four terms. In 1919 he ran for governor. He was instrumental in creating not only the city of Seal Beach, but Huntington Beach and Stanton, as well. It was his influence that allowed Seal Beach to win the battle of the seals against the big city of Long Beach across the bay. Elected to the California Highway Commission in 1931, Stanton continued to help Seal Beach and Orange County by building roads. Born in Cleveland, Ohio, February 4, 1868, the 77-year-old Stanton was to die at his home in Seal Beach on September 8, 1945. Among the residents of Seal Beach, anxious to help tourists, was R.D. Richards, proprietor of Tent City; Mrs. N.B. Wilson, of the Seal Beach Inn; O.O. Richardson, owner of a grocery and delicatessen shop; druggist C.A. Little; M.H. Snow, manager of the A.B. Snow Lumber Co.; F.E. Brown, carpenter and contractor; F. Haegerle and Louis Boiteaux, who sold oysters and clams; W. Floyd Stevens, who ran a dairy; M.L. Russell, rancher; Charles Brooks, caterer; D.R.S. Shaffer, who raised chickens; B.B. Brown who managed "The Seal" refreshment stand; W.J. Edwards, farmer; Chris Welland, apartment house manager; Ira E. Patterson, contractor; G.E. Moon & A.L. Havens, real estate agents; and John C. Ord, businessman, judge and post office manager, whose dreams of a city had been realized. Seal Beach is one of the most conspicuous of the recent real estate successes of Southern California. Since July 8, 1913, when this property was put upon the market, over $750,000 worth of property has been sold by the Guy M. Rush Company, according to representatives of that concern, who also say that 1914 promises to be an even more active year. Improvements of great scope are being planned, including a cement esplanade from Alamitos Bay to Anaheim Bay, making this one of the most delightful stretches of cement roadway on either the Pacific or Atlantic oceans. Seal Beach is now erecting a $12,000 school building, which will be fireproof and modern in every detail, and will afford excellent educational advantages. From 50 to 200 seals are at Seal Beach constantly and these constitute one of the main attractions of the place. 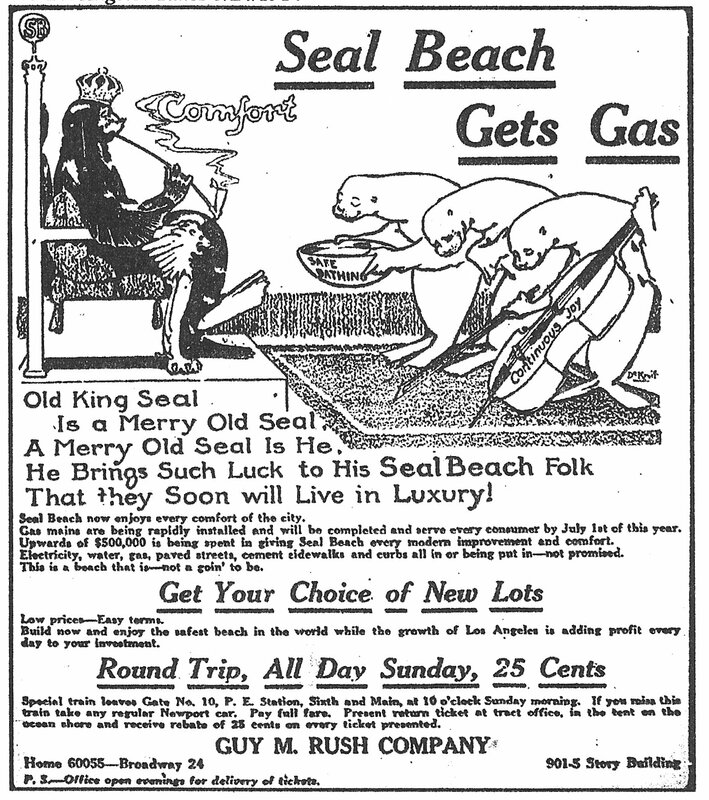 The Guy M. Rush Company has taken advantage of the preference of the seals for this particular spot of the Pacific Coast and has perfected every arrangement to feed them and keep them contented with the location. In 1914, the Mexican Revolution was underway. Many feared the violence across the border would spread to the United States. Local national guard units were sent to protect the international boundary line at Calexico. Military recruitment was brisk once rumors of war surfaced. 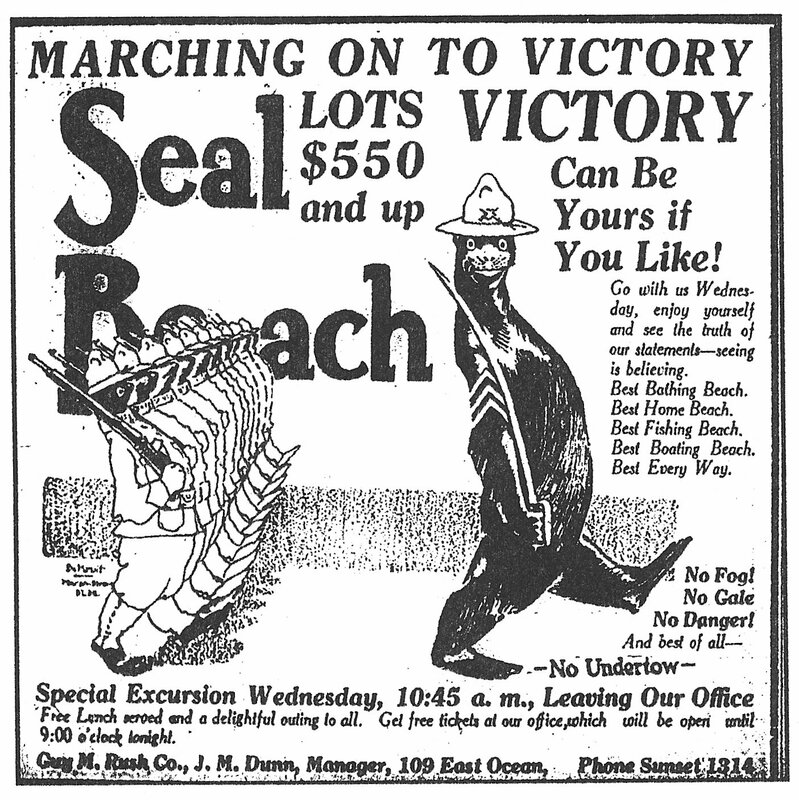 In this ad, DeKruif enlists his seals to protect America. In 1915, rumors told of Mexican revolutionary leader Pancho Villa fleeing Mexico to seek refuge in Southern California. Newspapers reported that he had gathered a big treasure and would soon cross the border and join his family. His wife, Juana, was living nearby, at Ninth Place and East Ocean Avenue in Long Beach. Another war was soon to erupt---on August 1, 1914, Germany declared war in Europe. "Here Ye! Seal Beach court is open. Bay and ocean frontage. This is the most ideal part of Seal Beach. Frontage on the Pacific Ocean - and the great twenty-foot cement promenade. Frontage on Anaheim Bay. City founder and judge John Ord might have gotten help with his legal backlog from this seal! "Seal Beach gets gas. Old King Seal is a merry old seal. A merry old seal is he. He brings such luck to his Seal Beach folk theat they soon will live in luxury! Seal Beach now enjoys every comfort of the city. Gas mains are being rapidly installed and will be completed and serve every consumer by July 1st of this year. Upwards of $500,000 is being spent in giving Seal Beach every modern improvement and comfort. Electricity, water, gas, paved streets, cement sidewalks and curbs all in or being put in - not promised. This is a beach that is - not a goin' to be..."
Natural gas mains were being installed in the city, something quite innovative for the time. The first commercial national gas venture was in Fredonia, NY in 1858, when the Fredonia Gaslight and Waterworks Company undertook commercial exploitation of this new source of energy. During the next fifty years scores of promoters developed similar natural gas wells, supplying factories as well as homes. Increasing production of petroleum after 1900 boosted available natural gas enormously, since it appeared as a by-product. "Seal Beach. 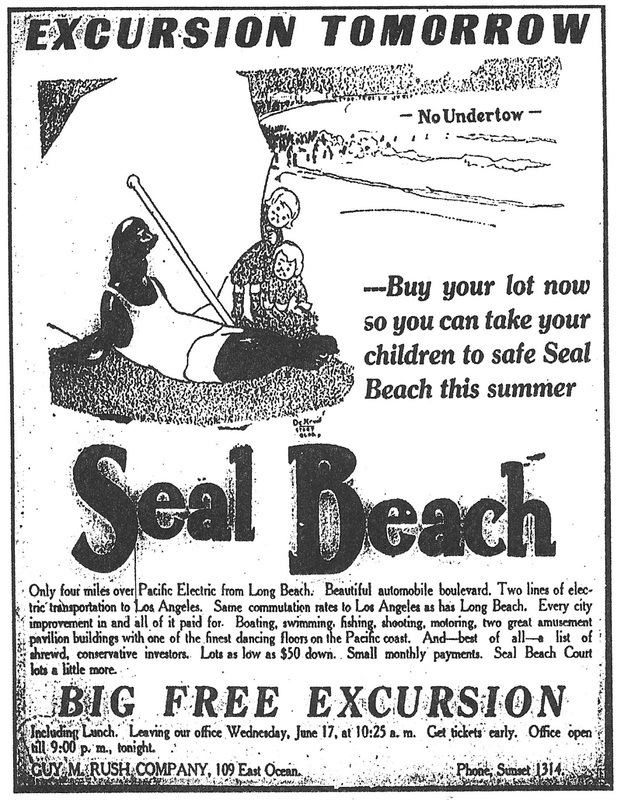 Seal Beach is at the place in the ocean where the undertow is left out. Seal Beach is 44 minutes from Sixth and Main Streets, Los Angeles, on the Newport Electric line. Seal Beach is just the other side of Long Beach - just this side of Anaheim Landing. Seal Beach fronts a mile and a quarter on the finest bathing beach on the Pacific Coast. Seal Beach is between Alamitos Bay and Anaheim Bay. Seal Beach has more still water sports than any other place in Southern California - look at the map of California and see how few bays there are on the entire coast - Seal Beach has two of them. Seal Beach has a new $100,000 amusement pavilion - try the new bowling alleys. 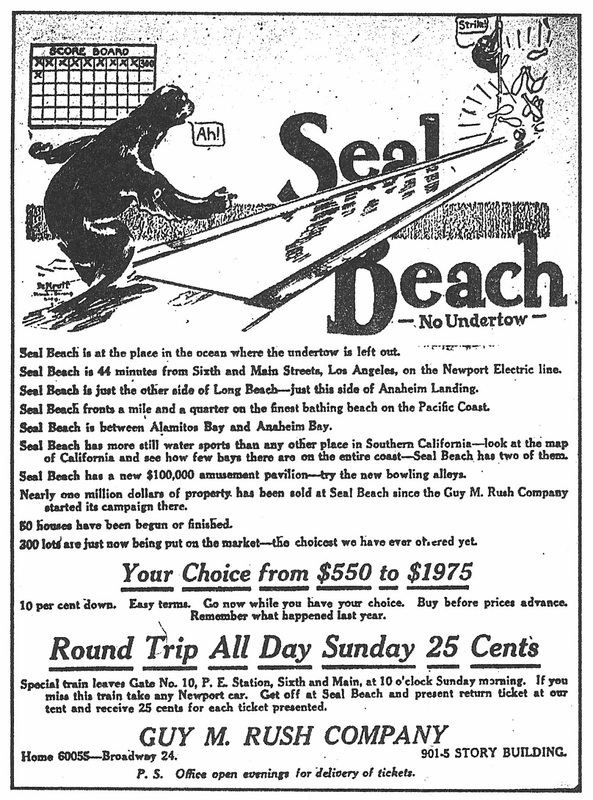 Nearly one million dollars of property has been sold at Seal Beach since the Guy M. Rush Company started its campaign here. 50 houses have been begun or finished. 300 lots are just now being put on the market - the choicest we have ever offered yet..."
This ad highlights the new bowling alley. You'd score big if you decided to make Seal Beach your home! "Every comfort is now enjoyed at Seal Beach. Gas, water, electricity, paved streets, cement sidewalks, and curbs. Ornamental trees. Twenty-foot cement promenade on beach, 1 1/2 miles long. $100,000 twin pavilion and pier. 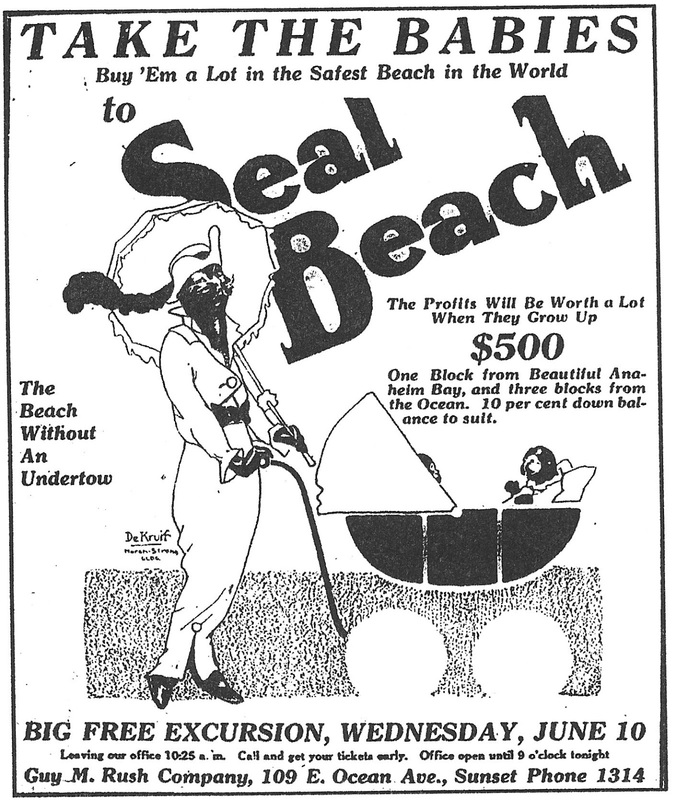 Almost $500,000 is being spent to make real comfort for Seal Beach folk..."
Women of the time were not all the romantic sort depicted in this DeKruif illustration. Iva E. Tutts added to one of the "comforts" described in this ad. Mrs. Tutts operated the first electric light franchise in Long Beach from 1895-1899. It was publicized as the "first electric plant in the United States, and probably in the world, to be installed and managed by a woman." The road supervisors of Orange County have let the contract for the first section of the Coast boulevard, a highway that is to extend all the way from the Los Angeles county line at Seal Beach, through Sunset Beach, Huntington Beach, Newport and Laguna Beach to a junction with the State highway to San Diego, below San Juan Capistrano. The contract for the first section takes in the district beyond Seal Beach south and east to Los Patos (a Pacific Electric stop between Sunset Beach and Bolsa Chica). This portion is built on the sand dunes between Anaheim Bay on the one side and the open ocean on the other. It will parallel the Pacific Electric Railway on the landward side. The width of the right of way is forty feet, and the width of the improved roadway is to be thirty feet, considered ample for all present traffic and for the future for at least ten or fifteen years. The 40-foot wide Coast Highway, mentioned above, had concrete 6-7 inches thick, which was poured in segments which took 28 days to cure. The cost of the highway was $9500/mile! During the summer of 1914 a twenty-five foot wide cement walk, lined with electric lights was built along the entire oceanfront from Alamitos Bay to Anaheim Bay. It was the perfect place to take a stroll with or without a baby carriage. ...One of the pretty seaside towns that is rapidly growing in popularity and population is Seal Beach, which is located on the shore of the Pacific ocean, about twenty-six miles southerly from Los Angeles. It is reached by electric railway every hour, the fare being 35 cents one way, 50 cents for a round trip and 35 cents round trip on a monthly commutation ticket, the time in transit from Los Angeles to Seal Beach being only forty-four minutes. Automobilists will find a hard, smooth highway the whole distance from the city to the limits of Seal Beach, over which the trip can be made, without exceeding the twenty and twenty-five miles per hour speed limits in a trifle over an hour, following the highway to Long Beach and out of that city to the east via Ocean Avenue. The permanent population of Seal Beach does not exceed 400, but during "the season," from May to November, it often reaches a population of 2000, and when the extensive improvements now going on are completed the population will be largely increased. The attractions of Seal Beach comprise surf bathing, on a splendid beach; also boating on inland waters and the ocean; also fishing, both on the inland waters of Anaheim Bay and Alamitos Bay, and from the pier out 1000 feet into the ocean; also watching the seals, which congregate in large numbers on their breeding grounds, the sandy point of Alamitos Bay; also dancing in the splendid pavilion which has recently been erected at a cost of $100,000, besides other forms of amusement which will readily suggest themselves to the visitor. Seal Beach is located between Anaheim Bay and Alamitos Bay, the shore line on the ocean being about one and a quarter mile long. The shore rises very gradually from the ocean, so that it not only offers exceptional advantages to the bathers, both adults and children, but is without any undertow and consequently is safe. Bathing suits can be rented and worn all day, if desired, for 25 cents each, the bather alternating lying in the warm white sand or meeting the incoming waves as they break on the sloping shore. In the bathhouse is a tide clock, which tells visitors the best time of day to go into the water. Both Anaheim Bay and Alamitos Bay have many varieties of fish which are readily caught by hook and line from row boats which can be rented for twenty-five cents an hour or $1 for a whole day, the arms of the bays extending inland along winding sloughs from three to eight miles. Oysters and clams are dug at low tide. There are probably three hundred cottages or flats at Seal Beach that were built exclusively for rent, and these were all occupied last year and will be again this year by those visiting the sea shore. Some visitors stay a week: others a month or more. There are excellent hotels and eating houses at Seal Beach, so that even if only a stay of a few days is made the public can be accommodated. The land company, which owns extensive acreage, has a large force of men and teams now at work grading lots along the shore front, and also has a large pumping plant which is dredging sand from the sea shore and depositing at needed points on the townsite. In the great pavilion four fine bowling alleys soon will be in operation, also an up-to-date cafe and a skating rink. Seal Beach will soon have a garage and probably a bank. In preparation for the incoming summer visitors, the streets and lots are being cleaned up and made attractive. A twenty-five-foot cement walk is being built along the entire ocean front the distance from Alamitos Bay to Anaheim Bay, a distance of more than a mile, and this is to be lined with electroller street lights. You can buy a small cottage at Seal Beach, completely furnished for four persons, with a lot, for $750, and pay $75 down and $10 a month. There also are lots in Seal Beach that alone sell for $5000. There are persons in Seal Beach who go out daily and dig native California oysters and clams, selling them for 25 cents a bucket. To the north of Seal Beach is quite an extended area of farming lands, one ranch there belonging to the Hellman estate containing 11,000 acres. It is contemplated subdividing this land into ten and twenty-acre tracts, thus furnishing homes for a number of families and adding to the importance of Seal Beach. Mr. Russell, who farms 550 acres of this land, has 200 acres in beans, 100 acres in sugar beets and 250 acres in barley, a sort of 3-B farm.